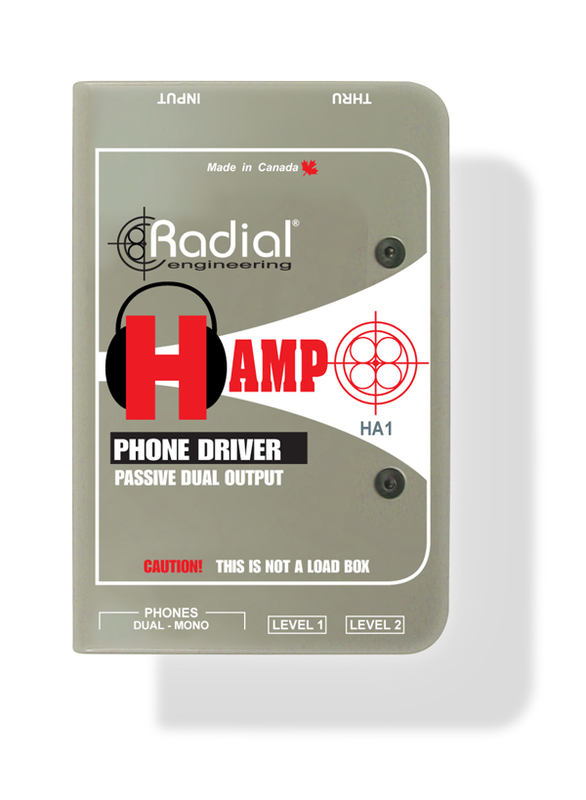 The Radial H-Amp is another one of those devices that so many folks have commented on saying: “Why hasn’t this been done before?” But like all good ideas, they come as a result of trying to find solution to a problem. In this case, the problem is obvious: You are setting up the stage for a festival. You have wedge monitors set up, some side fills, the PA, everything is set to go. The band shows up and the drummer or musical director asks where he can connect his headphones. The solution is easy if you so happen to have an extra mix out on the monitor desk and some type of headphone amplifier. But these are not always available and a headphone amplifier inevitably means you need to find yet another power drop. The H-Amp presents a solution by allowing you to simply take another speaker cable, connect it to the H-Amp and presto… you have now given the artist his own headphone box. He can adjust the volume as he sees fit, he can set the EQ to his liking and you can get back to doing a sound check. If you apply the same logic to a recording studio, setting up multiple headphones from a power amp is not as simple as it may sound. First, you need to figure out some way to daisy-chain multiple headphones together using proper speaker cable and how to go about giving each musician their own individual level control. You can certainly use one of the new digital matrix systems, but these are often complicated to use and expensive. The H-Amp makes it super easy! You simply plug one H-Amp into the next (daisy chain) and you are set to go. Today’s solid state amps are well suited for this application where as many as 40 sets of headphones can be connected using a single power amp. Because the H-Amp has individual volume controls, each H-Amp can then be adjusted to suit the musician’s preferred listening level and the filter EQ can be tailored to add extra click for the drummer, more mid range for the guitarist or extra high end sizzle for vocals. After we built the first H-Amp prototype, one audio engineer commented that with a 60 piece orchestra, giving each member a set of headphones is challenging and very expensive! The H-Amp could be ideal. He also suggested that we design the H-Amp to allow a second set of phones to be connected, effectively cutting the cost in half! Well… There’s something to be said about good old fashion common sense… so we added a second headphone out to accommodate. And since each headphone can be adjusted separately, the musician is still able to adjust the level to suit. And just in case each one wants a slightly different tonal balance, we designed it so that one headphone can be set flat while the other can be EQd. Simple… yet effective. The H-Amp is equipped with high power ceramic potentiometers and big fat load resisters to make sure that it is capable of handling plenty of power without concern. It is not a complex piece of equipment… It is a simple device designed to make a tech’s life easier when subjected to unknown situations that may arise. It can be used to test loudspeaker arrays, monitors and even be used to create an array of headphones for a press conference. Best of all, because it is 100% passive, you do not require any power to make it work. All you do is connect and you are set to go.